The Fear Beneath reported on this story when it broke, late Monday evening. Additional details have been procured and are provided below. A surfer suffered a “fairly massive injury” on his leg from a shark bite yesterday offshore of the Crouching Lion near Kaaawa, fire officials said. The man, in his 40s, paddled himself to shore after the 5 p.m. attack, accompanied by another surfer. Firefighters from the Kaaawa station gave emergency medical care to the surfer. “He looked pale when he got in,” said Kimo Beck, 55, of Kaaawa. 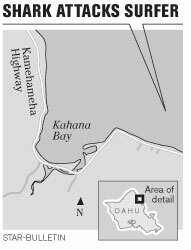 The state Department of Land and Natural Resources shut down Kahana Bay State Park for at least 24 hours, and the city Ocean Safety Division has posted shark warning signs along the beaches in the area. The fire helicopter and Ocean Safety personnel scanned the area for sharks, but none were spotted, Main said. Officials will decide today whether to keep the warnings posted, Cheplic said. Tiger sharks are more common aggressors in Hawaii waters, however. The attack took place about 300 yards offshore, in an area where another surfer escaped with a small gash on the foot after an encounter with a 12-foot-long shark last year. In the Aug. 28, 2007, incident, 15-year-old Joshua Sumait, of Hauula, was about 400 yards offshore on his bodyboard when he turned around to see a 12-foot shark take his right foot in its mouth. He kicked to get away and suffered only a 4-inch gash on the heel.